Travel into the heart of the majestic Denali National Park and Preserve on this 6-day trip that immerses you in six million acres of wilderness. As you travel to the Denali Backcountry Lodge over the exclusive Denali Park Road, you will be treated to views of the 20,320-foot Denali, the highest peak in North America, towering over low-elevation taiga forests and high alpine tundra. Watch for wolves and bears as you travel 95 miles over the park’s only road. Once at the Denali Backcountry Lodge, enjoy tranquility and a multitude of activity options including bike rides, guided hikes and historical and cultural presentations. Located along Moose Creek, Denali Backcountry Lodge offers cozy cedar cabins, rustic décor, scenic views and fresh and wholesome meals. Enjoy hot breakfasts served buffet-style in the lodge, a lunch sandwich buffet and a delicious, hearty family-style dinner. 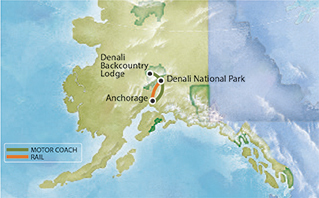 This unique tour will offer you a once-in-a-lifetime expedition into the heart of Denali National Park. Upon your arrival in Alaska’s largest city, we will meet you at the airport and transfer you to your hotel. Spend the day exploring this vibrant city situated between Cook Inlet and the Chugach Mountains. With nearly 300,000 people, Anchorage is a thriving metropolis that boasts art and history museums, a performing arts center with world-class entertainment, fine dining and an endless network of hiking and biking trails. Overnight in Anchorage. Spend the morning exploring some of the many shops outside the park before boarding a luxury railcar for travel back to Anchorage via the Alaska Railroad. Sit in the spacious upper-level seating area and be sure to visit the open-air viewing platform for some fresh air and more opportunities to catch sight of Mount McKinley. Inside the train, order a craft cocktail from the bartender, pick up a souvenir at the gift shop and sit back for a smooth ride. Upon arriving at the Anchorage railroad depot, transfer to your hotel and enjoy your last night in Anchorage. We’ll provide transportation to the airport, where you can fit in a few last memories of Alaska before boarding your plane. Be sure to check out the animal displays on the lower level near the baggage carousel, including a polar bear, a musk ox and an albino beaver. Grab a bite to eat at one of the restaurants serving local fare inside Terminal B and then wave farewell to the Last Frontier!